Matt Oetinger, owner and winemaker. Photo courtesy of Fernwood Cellars. 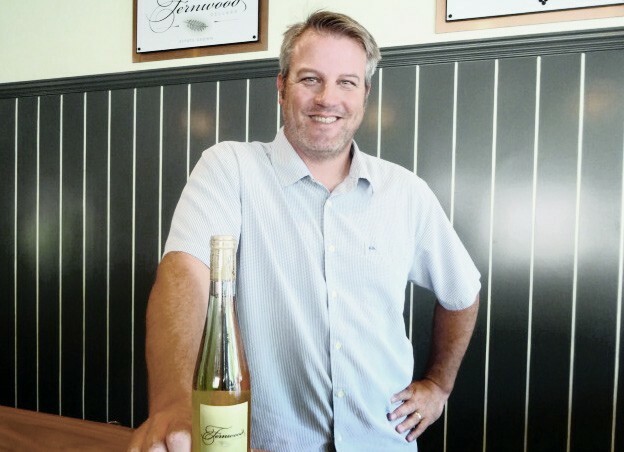 There is more to Fernwood Cellars’ wine than technique and terroir. Hints of history with, perhaps, notes of tradition. Located on the historic Redwood Retreat Road, the estate had several incarnations since Charles & Annis Sanders first bought it in 1836. From cabin to Victorian hotel, to lodge, to personal dwelling, each generation inheriting the property started a new chapter, culminating in a spectacular winery with acres of vineyards. Matt Oetinger’s passion for winemaking was first sparked by learning from his dad. Matt went on to study viticulture at UC Davis and managing another winery before establishing Fernwood Cellars in 1999. Built on the property that has been in his family for five generations since 1863, the winery remains a sacred place where the past generations’ work on the land and family traditions continue to influence the wines that Matt produces each year. What will make the best possible wine? According to Oetinger, this question drives every decision. Using estate-grown varietals exclusively, Fernwood is among only 7% of wineries to do so. This practice gives the winemaker more control over the entire process. From farming techniques to barrel choices, nothing is left to chance. Oetinger points out that he does not use “oak alternatives”, preferring instead to use real oak barrels of the highest quality. Producing only 3000 cases per year, Fernwood Cellars prides itself in handcrafting excellence in every bottle, using 6–7 estate-grown varietals planted over 100 acres on the property. Below is our interview with Lani Dorff, who represented the winery at the Los Altos Arts & Wine Festival. The winery is open for tastings the first and third weekend of every month. WineWednesday is hosted by George Paolini & Sherry-Lynn Lee in association with 23rd Hour. Wine Wednesday, S.2 E.9: Fernwood Cellars was originally published in WineWednesday on Medium, where people are continuing the conversation by highlighting and responding to this story. I would like to avail your services. i've in no way heard of a iciness care service for plant life and animals with feathers but only in [url=https://writing-reviews.com/freshessays-com-review]freshessays.com review[/url]. it'll be a new thing for me and i honestly need to try it this iciness so i would love to have your touch as quickly as you read my submit. I would like to avail your services. i've in no way heard of a iciness care service for plant life and animals with feathers but only in freshessays.com review. it'll be a new thing for me and i honestly need to try it this iciness so i would love to have your touch as quickly as you read my submit.